Black Ranger! Freakazoid! Jim McMahon! Ace Ventura! Anyone paying attention to pop culture during the week of March 6, 1995 knows what I'm talking about can only mean one thing. It can only mean POGs. because I am a much better POGger than you. Well, that and pop culture from the week of March 6, 1995, but those go hand in hand. For those who have no idea what a “Jim McMahon” is, let me explain. POGs were little discs of awesome 4cm in diameter. Kids would stack them on top of each other an use even bigger discs of awesome (slammers) to knock them over. If any landed face up (or down), the player who knocked them got to keepsie them. That is everything you need to know about POGs. Looking to relive my favorite week of 1995 (even surpassing my “burning an effigy of Val Kilmer for 'Batman Forever' week”) I went out and purchased some POGs. That, in and of itself, was not the easiest of tasks. It seems like other people realize we're not living 17 years in the past and thus don't have those products (no Hidden Treasures cereal either). 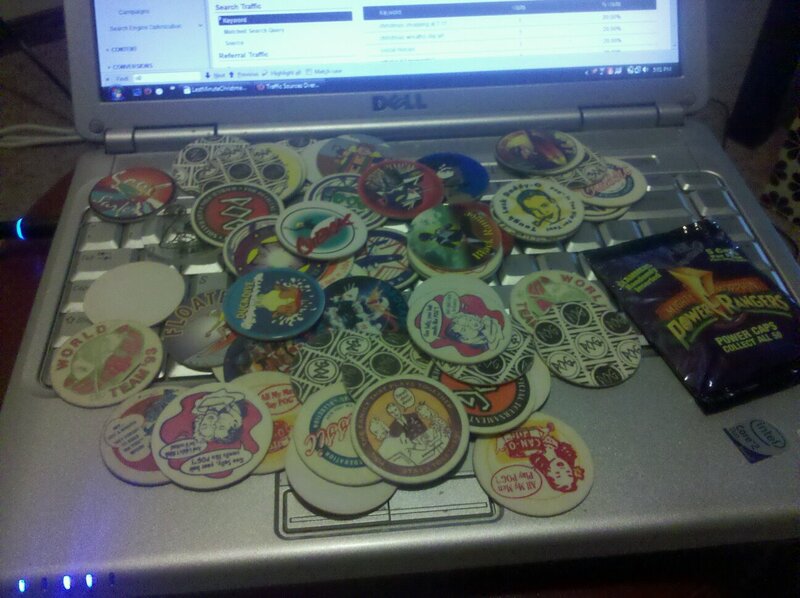 As a result, I needed to go on Ebay and order up ,my POGs. However, Ebay presented its own problems, because people seemed to think they were valuable collector's items and were listing them for 75 cents a POG. Even foils couldn't claim that value! I did eventually find someone who parted with 75 for $3.50 shipped. Quite the deal there. If only I had a time machine, I could go back several years and sell them for their face value of a dime apiece and suddenly find myself with a four dollar profit. But alas, I decided to bring them to work and challenge the local street gangs to a couple rounds. When I was growing up and everyone warned me about avoiding those street toughs who “did nothing but play POGs,” I never actually realized they didn't actually play the game. I guess it was just some cautionary tale to keep me out of a gang or prevent me from wasting time playing a silly game. All it actually did was cause me to create my own POGs out of poster board that I glued together and somehow convinced people to let me in on their games. When I brought my POGs to work, nobody wanted to play. I understand, maybe they were just afraid of losing their bitchin' “Brave Little Toaster” pieces, but I even promised we could play “no keepsies,” and they weren't for it. Even after I offered to give them my bitchin' “Brave Little Toaster” pieces, so I could win them back, they refused to play. Just ignored me and went back to texting. Even that reminded me further back of when I tried bringing them back in 1999 when I was a ninth grader. I'll never forget those upperclassmen and their glare as they said to me “Quit... playing... POGs...” Obviously, that freaked me out quite a bit. They were UPPERclassmen. Tenth graders at the least, most likely 11th graders. Even as a 27 year old today, that still freaks me out—I mean, they had double digits to describe the level of class they were. That ended that POG resurrection. This brings me to now. 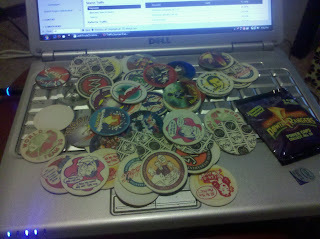 I've tried bringing back POGs on several failed occasions. It hasn't worked. But maybe this time, it will—I do have the Black Ranger on my side. Either way, I definitely have a calling card now—or at the very least, a business card.